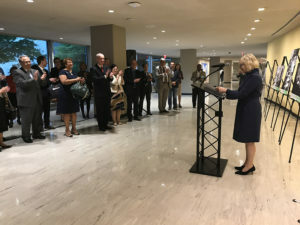 On September 28, Red T chair Vigdis Eriksen attended the opening ceremony of a photo exhibition celebrating the first International Translation Day recognized by the United Nations. She gave a statement on behalf of our worldwide linguist coalition that includes Red T, AIIC, FIT, IAPTI, Critical Link, and WASLI. We thank the Belarus mission for advancing the coalition’s joint cause of obtaining a legal instrument to protect translators and interpreters in high-risk settings.